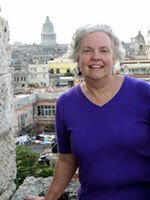 Leah Rampy, Ph.D., is an experienced spiritual guide and leader of pilgrimages and retreats. Passionate about Earth in all its beauty and mystery, Leah seeks in all her work to help others find their deep connection to the natural world. She is the founder and convener/guide for Church of the Wild ~ Two Rivers, an ecumenical emerging community that meets monthly in the midst of nature. Leah serves on the faculty of the Shalem Institute where she facilitates an online leadership program, leads pilgrimages, and serves as a peer group leader for Transforming Community: Leading Contemplative Prayer Groups and Retreats. Leah has spent a number years in leadership positions as an executive in Fortune 100 organizations, serving as Executive Director of Shalem Institute, and offering coaching and consulting to many individuals and teams through the business she created, Illumine, LLC. She has taught in public schools and universities in the US and Australia. For the past decade, she has been exploring and teaching about contemplative leadership, a way of leading that constitutes a paradigm shift from traditional leadership. Leah holds a doctorate in Curriculum from Indiana University. She and her husband live in a cohousing community in Shepherdstown, WV. They have two grown children.